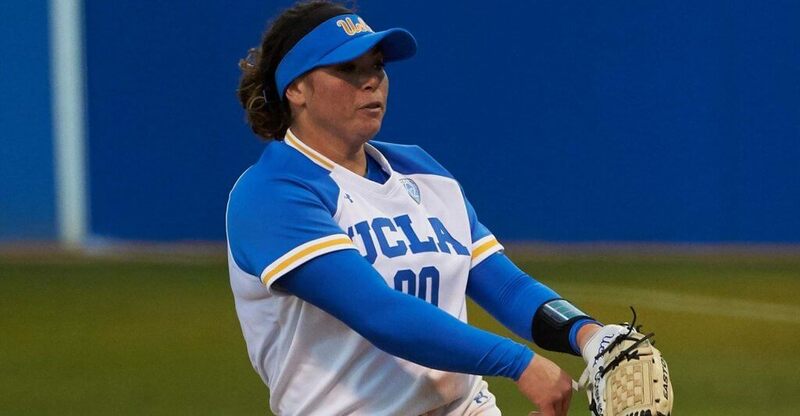 Rachel Garcia pitched UCLA to the top of the rankings on March 12, 2019. Photo: Don Liebig / ASUCLA. 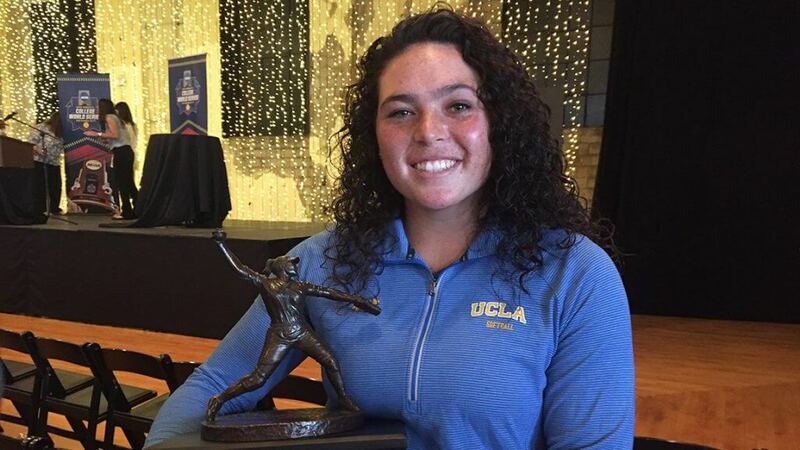 Rachel Garcia, the talented two-way pitcher/hitter for UCLA, is once again showing the form that earned her the 2018 USA Softball National Player of the Year award. Heading into this weekend's series at Arizona State, Rachel is 14-0 in the circle with a 0.54 ERA and 147 strikeouts in 91 1/3rd innings. At the plate, she's hitting .356 with six home runs and 31 RBIs and leads the top-ranked Bruins with 17 walks. The red-shirt junior has UCLA poised to make another run to the Women's College World Series where last year the Pac-12 power was knocked out by eventual champion Florida State (FSU won twice as it had to come from the Elimination Bracket). In a story we published last June, right after Rachel received the National POY honor, we recounted the scary story from her senior year of high school at Palmdale (Calif.) High when the eventual Gatorade National Player of the Year pitched a masterpiece, but saw her team lose in the CIF Southern Section Div. IV championship after going down with an injury. Rachel Garcia holds the trophy for being honored as the 2018 USA Softball College Player of the Year, but it hasn't been an easy road for her to get to this point. What a week it’s been for Rachel Garcia, the standout redshirt sophomore pitcher and hitter for UCLA! On Tuesday she was named as the USA Softball College Player of the Year and then twice in the Women’s College World Series pitched complete game victories for the Bruins to take them to the semifinals for the first time since 2010, recording 15 strikeouts in each contest. But neither win was easy, as UCLA had to overcome 4-0 deficits both games— first in a 7-4 victory over Florida State on Thursday night and then in a 6-5 nail-biter against Florida Friday night. Still, the fact that she has UCLA poised to make it to the Championship Finals after having had such a dominant year is remarkable when you consider that at one point in her career there were rumors going around the softball world that Rachel might not ever be able to pitch again. I was there on the night that the high school senior was on the top of her game as she was on the verge of winning a high school championship for her Highland High team out of Palmdale, California. 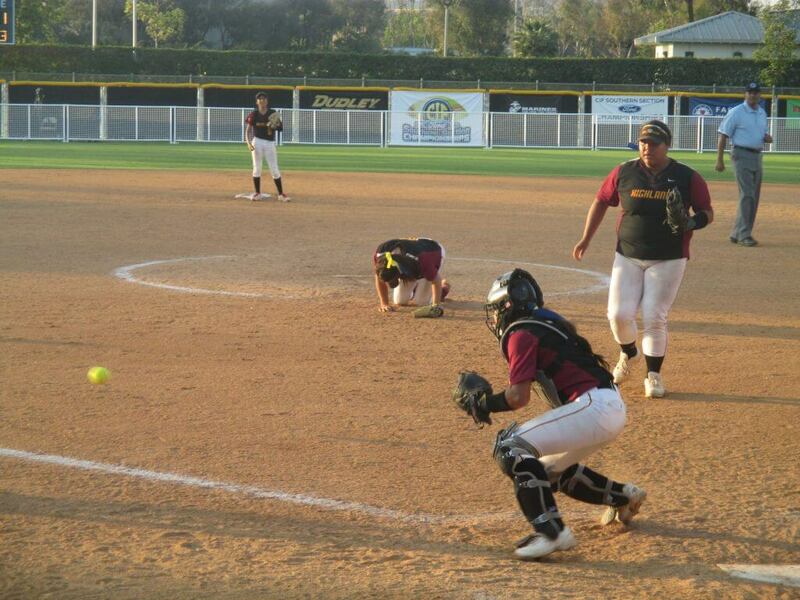 It was June 6, 2015 at Manning Stadium in Bill Barber Park, Irvine, California and Rachel and her team were in a battle with Torrance High for the CIF Southern Section Div. IV title. The future Bruin star was all but unhittable… the problem was, neither team could score a run. The game went into the 12th inning and Rachel had struck out 24 batters when she threw a pitch and collapsed to the ground as the batter singled with a runner on second. She had come down awkwardly on her left knee and the sharp pain made her collapse. Still, many didn’t see her fall as the potential game-winning runner was thrown out at the plate and the game continued into the 13th inning. All eyes were on the potential game-winning runner coming home in the 12th inning, but in the circle Rachel had collapsed when her left knee planted awkwardly. She even led off the top of the 13th with a single and ran down the first baseline looking no worse for wear.